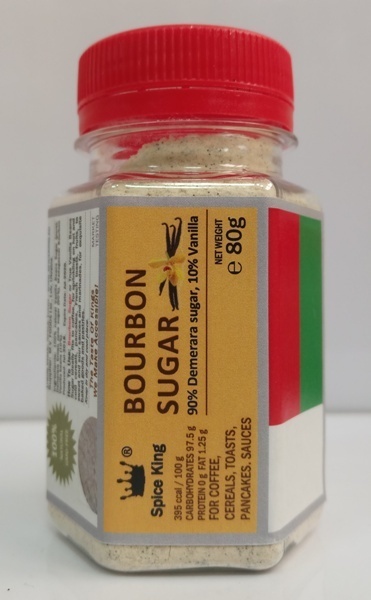 How To Use: Bourbon Sugar or True Vanilla Beans Sugar ideally fits to coffee, for sprinkling on hot and cold cereals, pancakes, French toasts, fruits, to sweet and sour sauces and marinades, for exquisite baked goods and pastry. Ingredients: 100% natural Vanilla Beans Sugar (pure): Demerara brown cane sugar (90%), Madagascar Bourbon Vanilla beans (10%). 100% natural, no vanillin, GMO free, no additives. Produced: Jul-2018. Expire Date: Jul-2020.